Last week I had the opportunity to try the vegan afternoon tea at La Suite West. 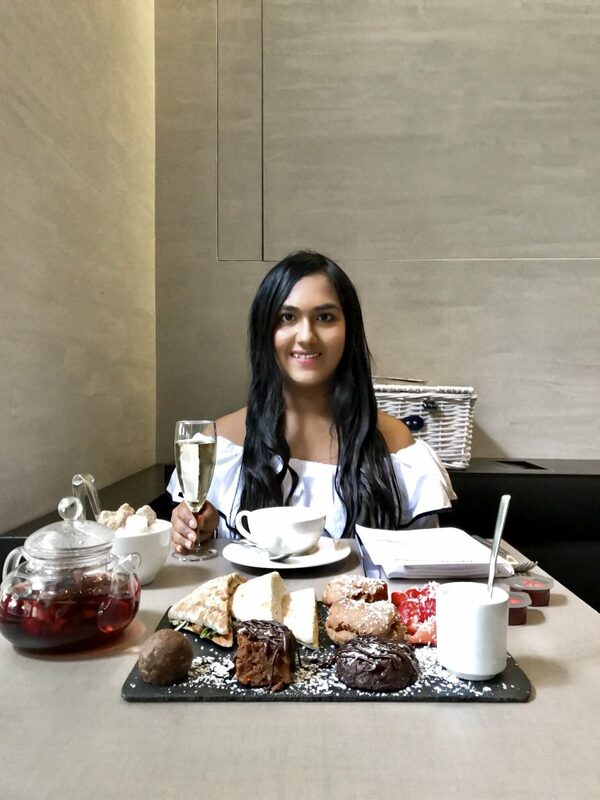 To be honest I had never heard of vegan afternoon tea in London and when I was approached by La Suite West pr team I knew I had to take this opportunity. 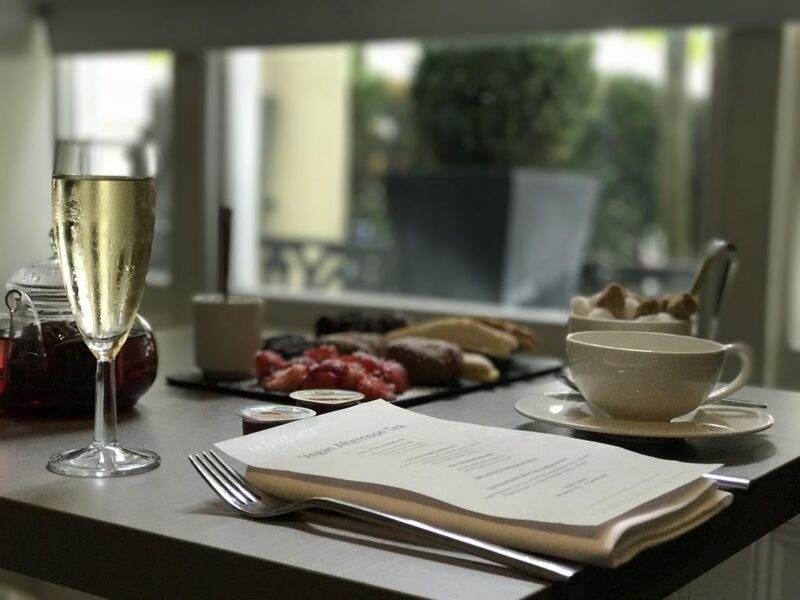 While there are plenty of fine hotels and restaurants in the heart of London, La Suite West located near the Hyde Park is certainly is one of my favourite hotel. The hotel’s minimalist interior definitely caught my eye as I am a huge fan of minimalist interiors and architecture. The hotel has a lot to offer in terms of price, an absolutely gorgeous view, the quality of their services and food. 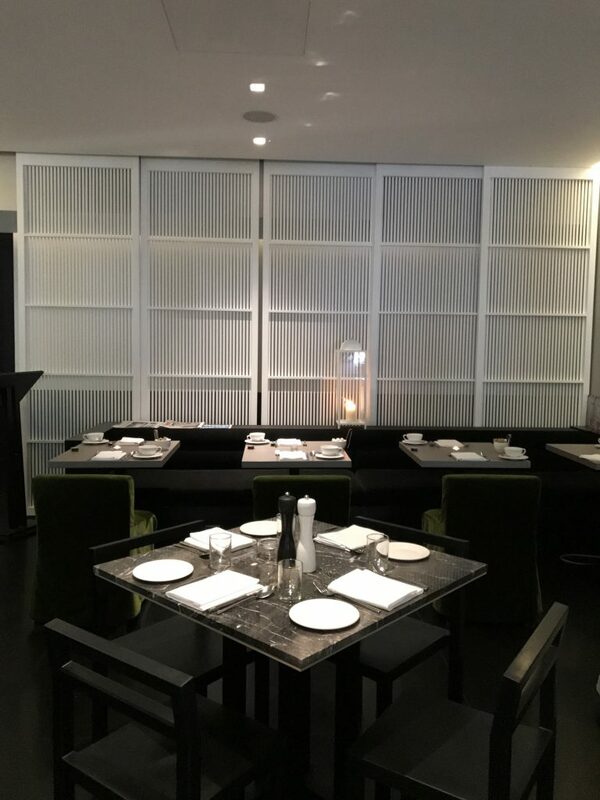 In collaboration with Nosh Detox back in June of 2017, La Suite West’s restaurant was relaunched after a huge transformation as a go to place for anyone who’s looking for healthy vegan food in the heart of London. It was specifically enticing for me to find a well-designed and decorated terrace that enables you to enjoy your afternoon vegan tea on a clear sunny day with a gorgeous view. However since it was raining the day I visited La Suite West, I sat in the restaurant which is equally well decorated. 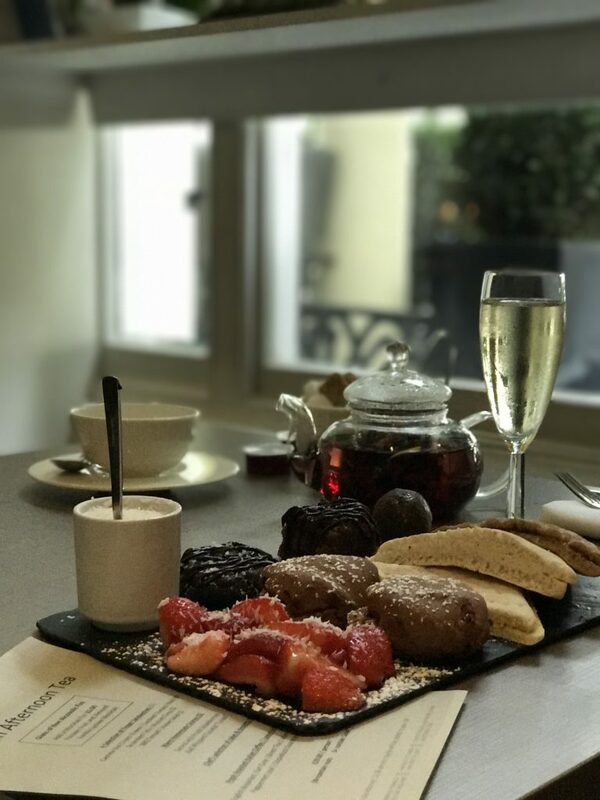 The staff at the restaurant offered me the best seat near the window and explained everything about the menu.The afternoon vegan tea is more like the specialty of the La Suite West hotel and is equally fascinating for the vegans and non-vegans alike. Costing just £29 for each person, I found it to be quite lavish for its price. It included non-alcoholic fizz (one glass), a couple of homemade scones with whipped coconut cream, three different desserts selected by the chef, and 3 delectable sandwiches. My favourite sandwich was the one with cashew nut cheese. Since I am dairy intolerant, I couldn’t believe I could eat a cheese sandwich. When you have that much on the menu, you are expecting to not like at least one or two things. But what amazed me the most was that everything tasted delicious and exactly how I expected them to taste. Not to mention that you have an option to pay an extra £6 and turn the non-alcoholic fizz into a mocktail which is great value.Kudos to the chef for making such a delicious spread. There is also a great selection of tea and coffee, I tried the hibiscus tea as I don’t drink black tea or coffee and I absolutely enjoyed it. The staff at the restaurant were very friendly and took care of all my requests. All in all, considering the huge variety of coffee and tea available, the afternoon vegan tea is certainly worth every single penny, in my personal opinion.I would definitely recommend everyone to give it a go while you are around. A big thank you to La Suite West for hosting me and providing a pleasant experience.